I like making stuff. Always have. I think I get it from my Dad, who is basically like MacGyver. I believe I have mentioned this before. I stopped making stuff years ago when I started consistently moving every few years. When you make stuff, you have to own stuff in order to make other said stuff. And when you own stuff and you have to move, that means you have a lot more stuff to carry which I just do not have the patience for. So no more making stuff for me. I realized while I was on my break over December that making stuff makes me happy. Not only that, it actually makes my brain shut up while I’m figuring out how to get this one part of this thing to glue to the other part of this thing… and before I know it a lyric I’ve been struggling with completely comes clear in my mind and I get to leave my workshop table and run over to the piano and finish writing a song. Hello – how rad is that? Workshop table… to the piano. That’s a win-win right there if I’ve ever heard of one. It’s like a personal form of heaven. The OTHER downside to making stuff and having to own stuff in order to make stuff, is that once you’ve made stuff, then you have to own that stuff too. I cannot believe it never occurred to me to sell anything I made before. Of course this was about a million years ago before Etsy existed. Totally fixed. I’m in the process of creating my own Etsy store so I can keep at my workshop table, keep my mind free and the music flowing, and you guys will reap all of the rewards by being able to get at the cool stuff I make. 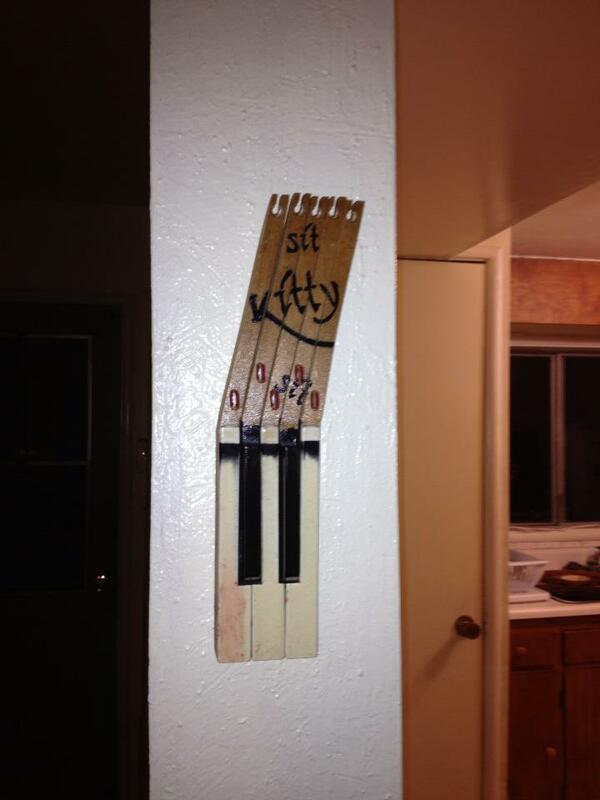 Mike’s new years present – these are keys that were left over from the piano we trashed for the My Beloved video shoot. You can see the key on the far left still has stage blood on it. Rad. I freaking love making stuff. The next question typically is “what kind of stuff do you make”. Answer? 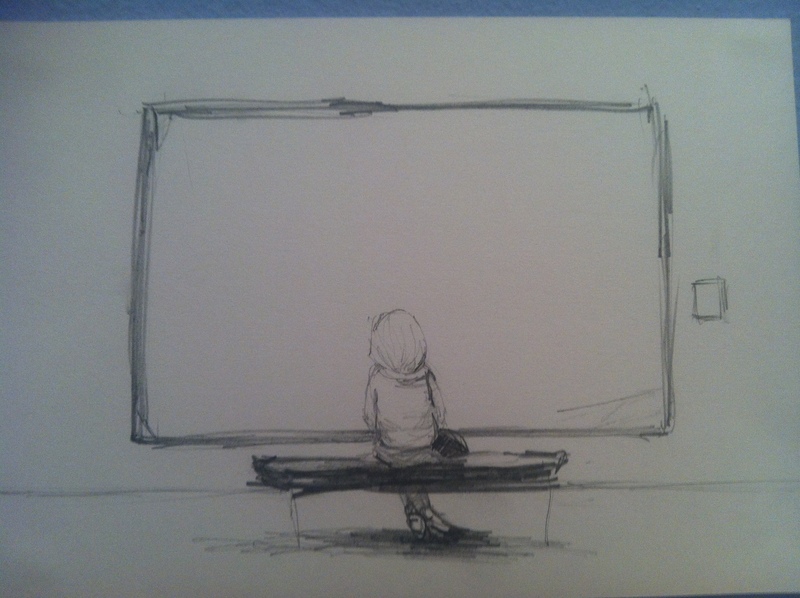 Anything I feel like. I’ve never really stuck to one thing. I’ve done everything from wood working to counted cross stitch and basic knitting to origami. I do really like re-using or up-cycling stuff as much as possible, so for me seeing what I can find and then what I can make out of it is one of my favorite things. 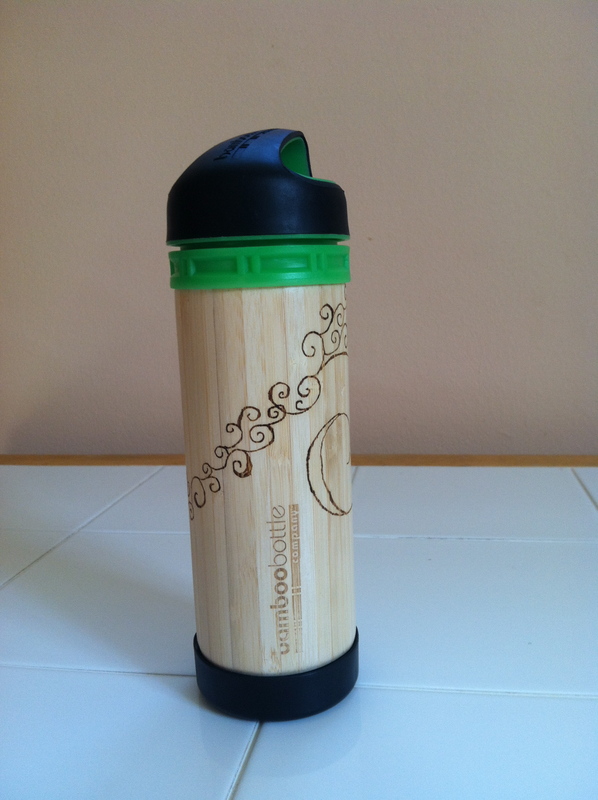 For instance, I got this cool bamboo bottle off of free-cycle, taught myself wood burning, and wood burned a hand-drawn design into it. That was super fun. As was learning to wood burn. I started by attacking my own cutting boards and wooden spoons in the kitchen. I figured, only me and Mr. F use them, so if I mess them up who cares? This bottle turned out great – and since I only had one, it’s truly one of a kind. Fun! The more difficult part is actually setting up the store. You have to take about 300 pictures of each thing you’re selling to get 3 or 5 good ones, then write descriptions, figure out pricing and shipping costs… blah blah blah. Every job comes with blah blah blah, though. Unless you get up there enough that someone else handles the blah blah blah for you. As Mike would say, “That’s the dream”.